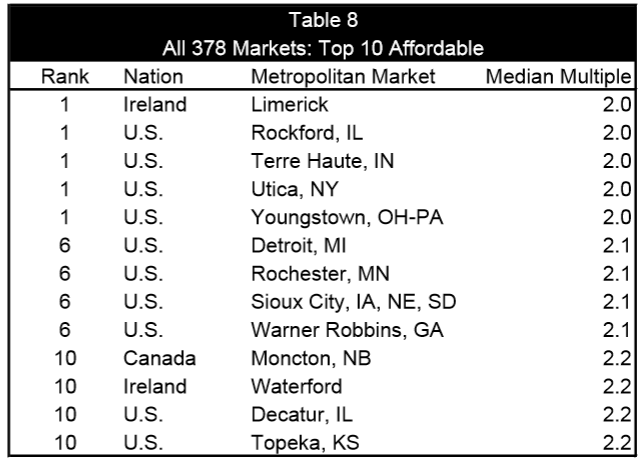 Congratulations to Hugh Pavletich and Wendell Cox (co-authors) of the 11th Annual Demographia International Housing Affordability Survey 2015, for another excellent job. "For the second year in a row, the United States had the most affordable housing among major metropolitan markets, with a moderately affordable Median Multiple of 3.6. 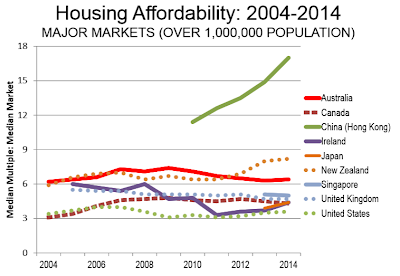 Canada (4.3) Ireland (4.3), Japan (4.4), the United Kingdom (4.7) , and Singapore (5.0) had seriously unaffordable housing. 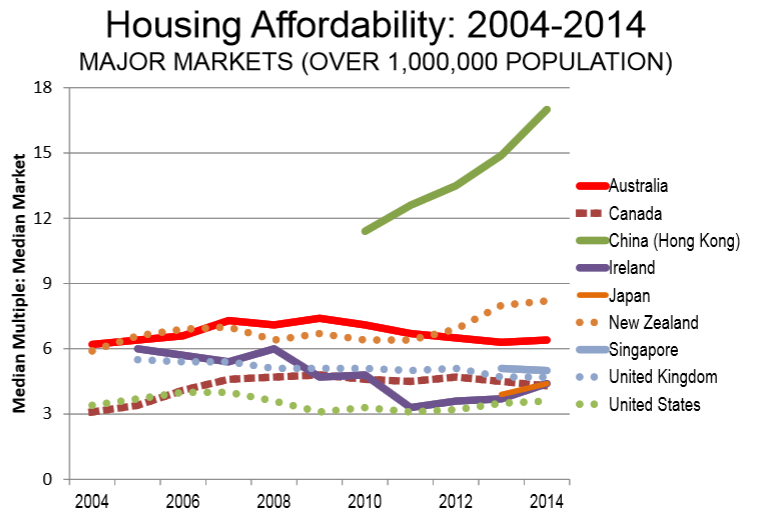 Three national markets were severely unaffordable, with Median Multiples of 5.1 or above. These included China (Hong Kong), with a Median Multiple of 17.0, New Zealand, at 8.2 and Australia at 6.4." The problem with the above chart is Hong Kong is so far off the scale, that everything else looks OK in comparison. So, don't be fooled by such distortions. My suggestion to the authors: A logarithmic chart may help. The following table will put things in better perspective. Anything over 4.1 is "seriously unaffordable" or worse. From a metro-area perspective things look even worse. Given that anything over 5.1 is "severely unaffordable", cities do not get a blue ribbon for being 10 points better than Hong Kong. Demographia does not cover China proper. However, The Economist does. The Economist China Index of Housing Affordability, which covers 40 cities of China shows the overall housing affordability multiple was 8.6. Vancouver once again was second only to Hong Kong, with a Median Multiple of 10.6. San Francisco and San Jose each rated 9.2. London (Greater London Authority) 8.5. Three other markets had Median Multiples of 8.0 or above, including San Diego (8.3), Auckland (8.2) and Los Angeles (8.0). 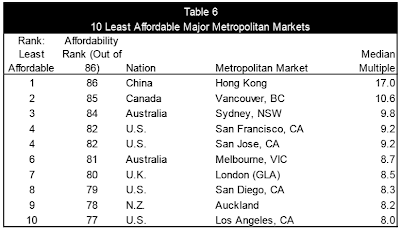 The Demographia International Housing Affordability Survey uses the “Median Multiple” (median house price divided by gross annual median household income) to assess housing affordability. The Median Multiple (a house price to income ratio) is widely used for evaluating urban markets, and has been recommended by the World Bank and the United Nations and is used by the Joint Center for Housing Studies, Harvard University. The "Median Multiple" measure may be the best way, but it's far from perfect as I am sure the authors would admit. 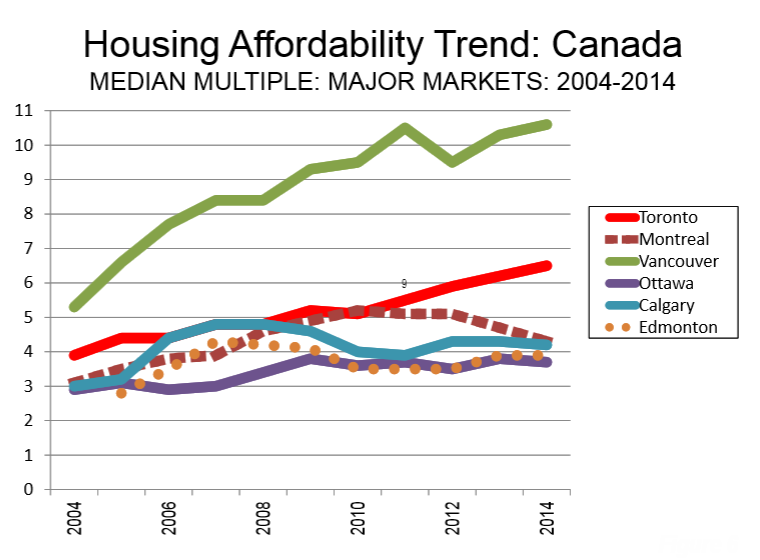 A simple chart on major metro area affordability may explain. Do you want to live in Detroit? Send your kids to Detroit schools? 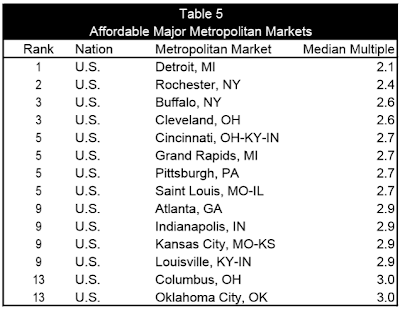 Are the houses that make up the median price survey livable at all? Inquiring minds may also wish to investigate Vancouver B.C. vs. Donegal Ireland Real Estate: What Will $890,000 Buy? Although I once visited Ireland and took many outstanding images on the trip, years ago, I know little about Limerick to comment. In contrast, I do know a bit about Rockford, Illinois. It's about 90 minutes away. Rockford is an economically depressed area in serious trouble. In fact, I have reason to believe the city is headed for bankruptcy. As facts come in, I will post on them. The same questions I posed about Detroit, I ask about Rockford. The only difference is no one has heard much about Rockford or other Illinois bankrupt cities ... yet. Do any Canadians readers care to comment about this? "Canada's most affordable market again was Moncton (NB), with a Median Multiple of 2.2. Both Saint John (NB ) and Fredericton (NB) had Median Multiples of 2.5. 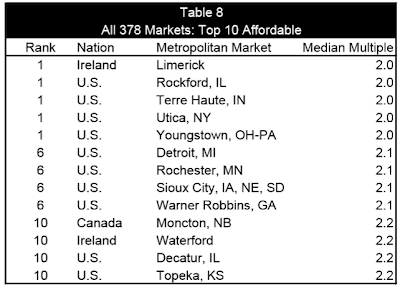 Other affordable markets included Windsor (ON), at 2.8 and Charlottetown (PEI), at 2.9." Given that Windsor and Detroit share a border crossing, I believe I know the answer, but if I get some choice comments, I will post them. While on the subject, here's an interesting bar bet question: If you are in Detroit, headed due south, what is the first country you hit? Here's the key to the answer: "Windsor is located directly south of the city of Detroit." The Demographia authors point out "no major metropolitan market without urban containment policy has ever been rated with severely unaffordable housing in 11 years." I have to ask: Which came first, containment or lack of land? Is there more usable land around LA or San Antonio? 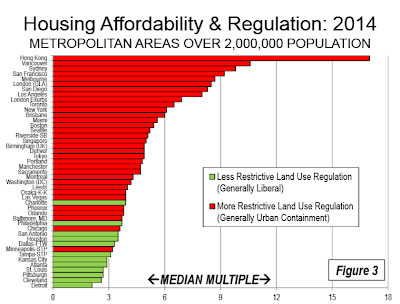 Is Detroit affordable because it has no land use restrictions or are there no land use restrictions in Detroit because no one wants to live there? In my view it is overly simplistic to place the majority of the blame on land use restrictions, even if restrictions are a major problem in some areas. There's much more in the 59-page report. Give it a look. Just don't expect perfection, especially in regards to affordability of places where nearly everyone wants out but lacks the means to escape. That aside, compiling data for all the major metro areas in the world is not an easy task. All in all, Hugh Pavletich and Wendell Cox did an outstanding job, once again. Their work is much appreciated.